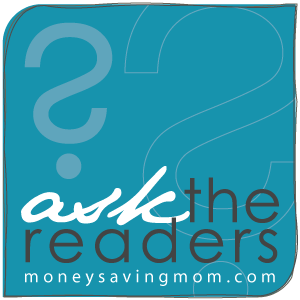 Ask The Readers: Meatless or inexpensive meal suggestions that guys would love? My husband really loves mac and cheese also the broccoli,rice and cheese casserole, grilled cheese sandwiches. Fortunately he also likes quiche and I make quite a few of those. Tuna casserole is another of his favorites. One thing I make is hummus. My boys are still young, but MAN can they eat! I also get a huge block of cheese and make chese sticks from it. The extra bits of protein help. Thankfully beans are still pretty cheap, so it doesn’t cost a lot. My boys will eat hummus straight or with some tortilla chips. Would you be willing to share your recipe? My little family of three LOVES hummus. I usually try to buy with coupons, but those are becoming hard to find. Sure. I got this one from weelicious.com. Put everything in a blender and blend it up. I love Weelicous.com because she has to man y different variations of hummus. I also add sun dried tomatoes to mine a lot. My husband likes mac and cheese, broccoli,rice and cheese casserole, tuna casserole, quiche. Mexican-type dishes. Use a lot of beans (smashed, refried, or whole), and then you don’t need as much meat. Add plenty of spices, salsa, etc., and it may fool them. My kids have no idea how many beans they are eating when I make burritos, and they love them. But the key is that you prepare and fill tortillas ahead of time. If it’s a fix-your-own type of meal, people will always put in more meat than necessary with just a few beans! Here’s a vegetarian chili with quinoa from my sister-in-law that I am planning on trying. Now quinoa may not seem cheap at first, but it really expands when cooked. It is quite filling and very good for you. I can get it in the bulk bins section for $3.19 lb. Since you would use much less than 1 lb in a standard sized recipe, I think you still come out saving money over ground beef. Plus the nutrition can’t be beat. I don’t eat meat but my husband is a hunter-fisher-super-carnivore (which is a great way to get protein for lower cost and keep active husbands busy). He actually enjoys when I make bean fajitas (sautée peppers and onions in oil, then stir in beans, a couple minced garlic cloves, cumin, red pepper and lime juice. Serve with tortillas, cheese, and salsa) or beans and rice (sautée a little diced onion with chli powder, red pepper, and cumin. Then add a can of tomatoes and a can of beans and simmer about 15min. Serve with cheese over rice) or stir fry with eggs instead of chicken or beef. Finally, there’s homemade pizza, which doesn’t have to be covered in meat even though most guys like it that way. Fill it with fresh vegetables and if you have to use extra cheese to please them that’s okay. I would love recipes WITHOUT BEANS. My husband can’t stand them! Can you hide them? My hubby doesn’t even know they are in there half the time. Just mash them up really well or puree them in a food processor. Then, you can add them to lots of dishes! I’ve even added them to spaghetti sauce! However, one of my hubby’s favorite dishes is chili over rice. I think I’ll go pop some in the crockpot right now! No no hiding them, he hates the texture. I really wish he would like them because I have such a hard time finding recipes. So many frugal ones include beans. Honestly,, I say if he doesn’t like them but your budget doesn’t support other options, he needs to man up and get over it. I don’t like beans, rice, or soup. Tough luck to me when the budget is tight. And over the years I’ve gotten to like them more and more. Unlike my bean-loving DH, I’ll never choose beans & rice over steak and potatoes, but it’s not that bad when seasoned well. I am not going to force my husband to eat what he despises. I agree with you. I would not force my husband to eat something he does not like, especially when there are other options. It has nothing to do with being a man ( man up). As for recipes without beans, what about quiche (if eggs are on sale), macaroni and cheese or alfredo, pizza with veggie toppings, breakfast for dinner, egg salad, big salads with lots of toppings, grilled cheese and soup, vegetable stew with mushrooms, potato soup and cornbread, cabbage and noodles, quesadillas, veggie fajitas. Eating vegetarian meals often and not eating beans you will really want to watch protein intake. Beans are such an easy, healthy protein and it’s hard to meet those needs without them. Dairy will provide some protein but not enough to live healthfully. Try this meatles chicken-fried steak. The texture is great, and it is a favorite of men and teenaged boys. I’ve had many readers tell me that they served it without mentioning that is was meatless until after dinner, and their sons were incredulous that it wasn’t meatless! I had many teenagers coming back for seconds on this when I made it for a church group before. Hey this is a novel idea! I’m going to try it at lunch for my kids before serving it to my husband. Using hm broth, inexpensive onions I stocked up on, bulk oats–it looks like a real budget meal! Thank you! Do you really use canned soup? I was surprised to see it on your blog recipes on another occasion. Also, eggs make a good sources of protien and can be cheaper than meat, think egg/cheese burritos, strata, breakfast pizza, etc… Peas, nuts, and soups can also help meat stretch further. My husband and I are right there with your husband! But beans are so good for you and cheap that I have worked hard to overcome my aversion. I find that great northern beans and black beans work best when pureed. They don’t have to replace meat entirely but they act as a great filler with any type of creamy soup, sauce or chili. I throw them in the blender with chicken or beef stock and puree them. Then still add chicken or beef in a smaller quantity. I wouldn’t force him to eat them but I would add them pureed in small quantities to foods where the texture and even the flavor isn’t really noticeable. For example my chicken stew recipe calls for me to thicken with flour so instead I thicken with pureed white beans, you can’t even tell the difference because the texture is exactly the same and the flavor gets lost in the chicken, vegetables and biscuits. But by adding a cup of beans I can use half the amount of chicken I normally would. Maybe that will help! In order to stretch meat in some meals I add cooked lentils. They are a great source of protein, cost very little, and are tasteless so they blend well. I have found I can still use a small amount of meat and make enough to feel my hungry crew (DH and two fast growing ‘tween’ boys). I can take 1 pound of ground beef (or turkey) and add 1-2 cups of cooked lentils to make enough sloppy joe for two meals and a lunch or two. I have added cooked lentils to lasagna, soups, pot pies….it can go into so many things! Lentils are also great in taco meat and if you get red ones they look like it! Great suggestion! Just adapt it to suit your family’s tastes and budget. For example, I don’t use Parmesan cheese because of its cost and lasagna tastes wonderful without it. I always make spaghetti with hamburger in the sauce, but I didn’t have any the other night, so I added chopped yellow and zucchini squash. It helped fill us up a little more, and added a little taste to the sauce. I do this too. Except I have to cook them on the side because my little kids won’t eat zucchini. You have to go on Youtube and look up Zucchini Gummi Worms. I know sounds weird, but I’ve made them and my son loves them. Granted they are given some help, but he gets to have some “candy” that’s made with zucchini. We have some going right now! I love to make black bean burgers. They’re super healthy and very inexpensive especially if you purchase a bag of beans rather than a can. They’re very filling and a great meat alternative! My boyfriend loves them! Would you share your recipe?? I make vegetarian chili and lasagna which is very hearty and fairly inexpensive. Also don’t forget about faux meat. We love gardenburger’s crumbles. Used in both chili and lasagna, you can’t tell it isn’t meat! I made this vegetarian meatloaf last night, and all my meat eating men LOVED it! If you get dry lentils, and cheap oats, & use coupons for the cheese and tomato sauce, it’s super cheap. I served it with bow tie pasta and peas, and a homemade gravy from veggie stock. I calculated the whole meal at around $1 a serving . . . but might be a little more depending on how much your guys eat. Wow another novel idea here! Thanks for sharing. Homemade scalloped potatoes and ham is a great option. All my boys love this. I do about 1 lb. chopped TEENY tiny ham to about 5lbs potatoes. Fills them up. Agreed! Potatoes bought at loss leader price, half price after holiday ham, use chicken stock instead of milk (yep works great!) and add just enough hot sauce to increase the flavor really makes this dish a winner! It doesn’t even require cheese but melting some on top right before serving makes everything think it is full of cheese. The hot sauce replaces some of the strong flavor you are looking for from the meat. I make this as well…one ham steak for $3 cubed up small, layered in between layers of potatoes with a sprinkling of flour , salt, pepper in each layer and then milk poured 1/2 way up and bake till taters are soft and browned. One of families favorites and a great way to have the kiddos included in layering of the spuds. Breakfast is always good, eggs have lots of protein, grilled cheese sandwiches, veggie pizza or even just cheese, meatless lasagna, tostadas, cheese enchiladas, peanut butter and jelly, iand I even make fried rice with just egg and no meat sometimes! My biggest tip is to use meat as more of a side dish than a main course. Incorporate it into soups, stews, pot pies…things that you can supplement with cheaper ingredients but still keep carnivores happy. Also, try using cuts of meat you’re not used to using. I recently switched from using ONLY boneless, skinless chicken breasts (expensive!) to using whole chickens and bone-in breasts…and just removing the bones myself. It’s a bit more time consuming, but to me that’s worth the money saved. Lastly, you could try a one-vegetarian-meal-a-week rule where you fix something like a pasta dish sans meat. Just one meatless meal per week can boost savings like crazy …AND it’s healthy. Do you have any tips on how to cook lentils? I have a bag sitting in my pantry and have no clue how to cook and incorporate them. TIA for any help! Rinse them off. No need to soak. Put in pot with water (more than covered). Bring to boil, reduce to low. Cover. Cook until soft. Drain extra water if desired. I do mine in the crockpot with other ingredients, so it’s a stew. They are not gas-causing, like other beans! You don’t need as much meat in a dish as you think. Veggies, rice and pasta can stretch out that meat. Look up vegetarian meatLoaf recipes. My hubby and son, who was two, loved when I made that . Also, chicken chilis are great because you can buy chicken for as low as 79 cents per pound on sale plus beans. Also, though it costs more, quinoa packs extra protein into a meal to make it extra filling and therefore lasts longer! Also, pack in more veggies for fiber! That fills someone up and you can use beans instead of meat. I also had a friend awhile back who had 6 kids and she would mash black beans into her ground beef before cooking to make it go further! One of my daycare kids favorite meals is a box of whole wheat pasta cooked and then mixed with 1/2 jar of spaghetti sauce and a cup of shredded cheddar cheese. They devour it, the whole wheat helps fill them up and hold them longer and it is cheap to make a big batch. I have made the Chicken Fried Steak without the Chick from the Prudent Homemaker before, and it was fabulous. (No beans, either!) My husband was really excited when he saw it, because I never make chicken fried steak or meals like that, and he loved it. Afterwards, I told him it was meatless, and he was really surprised (and pleased, too!). Some of our favorite vegetarian dishes that seem more like meat are black bean burgers (use grill seasoning to make them taste more like meat), chickpea burgers (use chicken bouillon to make it taste more like chicken), and lentil sloppy joes. If you learn to make homemade hamburger buns then these are cheap, filling, and nutrious meals and they all take very little time to make and still seem like a “real” meal. Its for crispy burritos – and the crispy-ness is what made them not miss the meat!! Some of my favorite meatless meals: Split pea soup topped w/ cheese and Greek yogurt & WW popovers, potato soup with herbed bread, & pizza. We do meatless meals quite a lot. Not just because of the rising costs of food/meat, but because it is a healthy way to eat. And we like it! I pretty much cook everything from scratch, so your mileage may vary with these suggestions. Any time you combine a bean and a brown rice, you are getting a complete protein. Pretty much any way you make meat you can make beans. – we use a LOT of eggs: omelets, quiche, scrambled eggs, poached eggs, deviled eggs–all feature prominently in our weekly meals. – pasta with fresh sauce, or pesto, with fresh veggies or white beans. – grilled avocados — use them with other veggies, rice, and beans for a nice protein kick! Do you have a recipe for mung bean burgers? They sound yummy! We tried going vegan, but my dh won’t eat beans. There are, however, tons of great vegan websites. happyherbivore.com has great recipes for entrees. All of my baking is now vegan, and her baking recipes are super yummy. The blog Peas and Thank You is really good, too. Here is a super cheap cut of meat, country style spare ribs. Here is a good recipe I found. Pureeing beans can hide them well. I understand not liking beans, especially black beans. Also, salads madewithquinoa are awesome. Tuna salad is great and you can add mashed chick peas. Google high protein non meat foods. Don’t always make high nut content foods either bc of the fat. Buy managers special meats. If a local grocery chain sells fried, baked, and rotisserie chicken they may put them on half price after 8 pm. We have Kroger king soopers here and my husband will stop in at 8 pm and nab the large whole, cooked rotisserie chickens for $3.49 each… 50% cheaper than when I get groceries in the morning. Wewould let them cool, then pick all the meat off and freeze it for use in chili, salads, enchiladas, etc. on that note, enchiladas can be super filling, especially if you can hide beans. Great northern white beans I really like because of their mild flavor and the canned ones are really soft and don’t have the same texture of other beans! Great tip about the buying “late” rotisserie chickens. I’m going to try that! I do this at Walmart all the time. Put all the bones and skin in your crockpot with some veggies like onions, carrots and celery. Fill the crock with water and cook on low for 24 hours for nearly free chicken broth. My first thought was breakfast for dinner — pancakes, waffles, french toast, omelettes (you can stretch a little ham or sausage that way if you have it. If not, veggie omelettes are yummy). Try a baked potato bar topped with leftover meat and veggies (chopped chicken, broccoli, and cheese are good). Another idea is chili — I know, a little out of season. 🙂 But you can make a pot of it with extra beans (half the meat, they likely won’t notice) and use it as a topping for baked potatoes, hot dogs (think Sonic’s chili-cheese dogs), or even french fries (bake the fries to cut down on grease). Pizza can be a good option – either little or no meat on it. We also do a lot of grilled kebabs (sp?). When you dice the meat and skewer it with veggies, a little meat can be stretched further. Bean and Cheese quesadillas or burritos can also be done cheaply and are “man-friendly.” Homemake your own bread and make peanut butter or grilled cheese sandwiches (mine think that homemade bread makes the sandwich better and more filling). I wanted chili dogs this weekend but didn’t want to go to the store for canned hot dog chili. I took a bit (like a 1/4 cup) of leftover ground chicken taco meat and mixed with a can of pinto beans, an 8 oz. can of tomato sauce, some diced onion, a bunch (probably two to three tablespoons) of cumin, about a tablespoon of chili powder and maybe a teaspoon of sugar (measurements are approximate as I just threw them in as I went). I then added a 1/4 cup of water to the mix. I let is simmer on the stove for about an hour and then took my immersion blender to it. It looked and tasted just like a drive in (a la Sonic) chili cheese dog. It was SO good!! Here is my list I have compiled on my computer for when I plan my week.. all vegetarian/vegan and I can usually fit any of them into my weekly budget. Eggplant parmesan is great because eggplant really has a meaty kind of texture to it. My husband is sooo anti vegetarian, but he loves eggplant parm! So I’m guessing you pulled the post with cornbread/dog muffins? I’m glad I saw it first because it’s a great idea. I’ll definitely be making it. Sure! There are lots of options. I am vegetarian/part time vegan in a house of meat eaters! You can do black bean quesadillas, pizza quesadillas, spaghetti with a homemade tomato sauce with veggies…if you are feeling daring, try Field Roast’s vegan sausage…all grain meat substitute…it’s delicious. Throw that in as a “meat” component to the spaghetti and sauce. Grilled cheese is always a hit! Burritos are always fun and you can put so many veggies in there! Vegan BLTs made with Lightlife’s Fakin’ Bacon are delicious! You can also do a mozzarella with roasted red pepper and pesto panini…so yummy! Breakfast for dinner is always fun! Try making waffle and pancake mix from scratch with some pure maple syrup and fresh fruit. 🙂 That is always a hit in our house! Also you can make a nice, rich veggie chili over basmati rice or brown rice! We almost never serve whole servings of chicken breasts as a main dish. If it’s cut up and then prepared it seems that we eat less. Just think, a chicken breast can make quite a few chicken nugget pieces or crockpot chunks! Do you know how to cook with whole chickens and make homemade stock? Sometimes chickens go down to 69 cents a pound, and if you’re making a gallon of stock from that too (which you can freeze), there’s not much of anything carb-filled that’s cheaper. And soup made with homemade stock and relatively small portions of meat can stretch far, be super healthy, and is so convenient! I read somewhere, and I’m not sure it’s accurate, that using just a tiny bit of meat in legume dishes increases the protein absorption. It may not be accurate, but it’s certainly interesting. If you use cheap chicken, pork, or beef cuts to make shredded meats, like bbq, italian shredded beef, or mexican shredded meat, it seems to “fluff up” and stretch farther. I use cuts like bone-in chicken breast (sometimes 99 cents/lb), pork loin (sometimes $1.99/lb) or bone-in roasts like chuck or shoulder from the side of beef in our freezer. And if it’s got a bone – you can make stock, too! Tuna goes on sale with coupon match-ups quite often. Cans of salmon are about $2 at Aldi, and that makes nice salad, melts, and patties, too. And canned salmon is always wild!!! When I was a newlywed college student, I used to think we couldn’t eat any meat. Now I know it’s much more important that I’ve learned to prepare the meat economically. Meat other than beef can still be purchased amazingly cheaply here in KY, and carbs can’t seem to compare to the satiety and mood-balancing effects of a meal that includes animal protein. So that puts chicken, pork, and our stock-yards purchased beef at a great bargain in our house. If they love meat, going meatless will be a hard switch. Better to ease back on the meat gradually. Don’t serve it by itself. Incorporate it into dishes. Most recipes can be made successfully with less meat than is called for. Spices are key. I’m a big meat lover myself, but I love Indian food – even the dishes without meat. Dahl (lentil) is amazing – and I really don’t miss the meat, which is saying a lot for me. Go to an Indian restaurant to see how it really tastes, and then look for recipes to make at home. I love all the suggestions. One thing I have done is to still include meat, but keep the rest of the meal simple—rice or potatoes and vegetables. I find that my budget goes out the window when I make things that require several different ingredients. Also, we like chicken fajitas (chicken made in the crockpot) with rice and beans. Since only a little amount of chicken is needed in a tortilla, it stretches the chicken for more than one meal for us. May I direct you to our family favorite, meatless nachos? It uses lentils instead of ground beef, so it’s super cheap and filling, and everyone can put on as many toppings as they like. Beans and rice! We deep fry our own corn tortillas for tostados. Make your own beans a good recipe is on goodcheapeats.com. Pile them high with lettuce tomatos, avacado, and cheese. Just a note, be careful with faux meat…much of it is processed and not necessarily the best for you, healthwise. Stick with non-GMO organic tofu, tempeh or miso as a quality mean substitute. You can’t go wrong with beans (and dry beans I believe are less expensive, you just have to soak them). We love this Tofu Parmigiana recipe — I have a 6, 4, and 1 year old, and they gobble it up! I add mashed pinto beans to a lot of things that include hamburger. I use a 2:1 ratio of meat to beans. I have added the mashed pintos to hamburgers, taco meat, and lasagna. My children have never complained or even noticed! My husband does notice, but you can’t taste the beans when they are mixed in with everything else or topped with a bun and cheese! I make the pintos in a big batch, mash and freeze in containers for when I need them. Chili is a favorite for our family. (3boys, 2 girls +the hubster) I use several different types of beans…black, kidney, red beans, chili beans. Originally, I also used meat and then then next step was half the meat, then the next time I just left it out completely. They didn’t even miss it! I guess all the beans just distracted them, lol. Anyway, it worked and now its much cheaper! Buy chicken on sale. Any kind of sausage or ham and rice are the main ingredients. Will make a huge pot and this freezes well. Potato soup, fried egg sandwiches, ramen: cook, drain all but a little water, add seasoning packet. Serve with a sliced boiled egg on the top and a little soy sauce. Sounds strange, but my family loves it! Also, so things to make the meat you do get go farther. Add fillers liked rice, pasta or veggies. You can use inexpensive meats, too. I use hot dogs and tuna fish more when we are really broke! Hope this helps! Do you have a recipe for the Pad See Ew? It’ s my FAV takeout meal, I’d love to be able to recreate it! I’d love the recipe, too! Trying to do meatless Mondays (and also to serve something simple and filling to a Bible Study group that meats at our house (that includes vegans) – I found this recipe that is CHEAP, easy, filling and delicious! It satisfies even my carnivorous husband! When lentils are cooked, stir in 3 cans of your favorite sloppy joe mix and heat through. Serve over rice or even on buns. (I usually can get canned sloppy joe mix for under a dollar and the pound of dry lentils translate into the equivalent of 3 pounds of ground beef (for only a dollar!). This usually makes 3 meals for us..it freezes well. You can use your own homemade sloppy joe mix with it too!. We make one “fancy” meal a week where meat stars as the main dish (grilled tilapia, chicken, etc.) but the rest of the time eat meatless dishes or serve meat as a “side” in an otherwise inexpensive meal. Eating meat less often makes us really appreciate it once a week. Vegetable lasagna, lentil rice casserole, black bean quiche, bean burritos, ratatouille, breakfast for dinner, and soups are favorite meatless dinners. Add beans, rice, or other fillers to your meat to make it stretch further. My friend posted this awesome recipe for a layered-dip they made into a fiesta, meatless dinner! I made it last week, and the men of my house loved it! There are lots of really great ideas in these comments! One word of caution in decreasing the amount of meat: do be sure you are supplementing the meal with plenty of other protein sources (eggs, beans, nuts, etc.). Our digestion works best when we have enough protein. Same thing with our bodies — they work best when they have plenty of protein. Just adding cheese to something will not supply enough protein to enable our bodies to function at optimal levels. Along those lines, some people need more protein than others. I’ve read some frugal recipes that sounded delicious, but my blood sugar would go haywire if I didn’t pair them with meat. I think people forget that for those of us without protein diminishing medical problems 6 to 8oz of protein is all we need per day. We tend to eat 6-8oz of meat or protein per meal! Often we get over half of our protein from sources other than meat – cheese, eggs, beans, some vegetables, other dairy, etc. all have some protein in them so we don’t need a whole lot of protein. Overloading on starch is what poeple usually do to make up the protein – try veggies or fruit instead. By all means choose healthy non-meat based proteins. But when I had gestational diabetes I was required to get at least 7-21 grams of protein per meal, plus three snacks of 7 grams of protein each. Even though I’m no longer classified as diabetic, my doctor has encouraged me to continue with the diet in an effort not to develop permanent diabetes. Just a note for those at risk for diabetes. Make sure to pair your carbs with protein and remember that many protein sources such as beans and nuts do have some carbohydrates in them. Go crazy with the veggies too, but watch the fruit intake. I agree Lea. I took a nutrition class in college and had to document everything I ate for three days. I only had meat once during that time, but when their program calculated the amount of protein I got I was 30 grams over what I needed per day. I always thought that I didn’t eat enough protein,but my professor was actually concerned about the health consequences of eating too much protein. Based on a 2000 calorie a day diet we only need 3.5 ounces of protein a day. This can vary from person to person depending on your lifestyle. I have a heart/diabetic friendly diet of 1500 calories a day and I still need the 3.5 ounces of protein. We also need to consider complete proteins here. If you eat beans alone it is not enough. You must have some sort of starch to make it a complete protein such as, beans and rice, baked beans and brown bread, or barley and lentil soup. Nuts also can play a role here. Steel-cut oatmeal is a great source of protein. I use 1/2 cup dry oatmeal with 1 1/2 cup water per person. This serving size provides 20 grams of protein. I buy a 5 lb bag of steel-cut oatmeal in bulk at Outpost Natural Foods for $4.95. Economical and a great source of protein. To cut down on meat, I amp up the veggies & fruit. We usually have 2-3 veggies, plus a fruit at dinner, along side meat. I try not to make meat the focal point, but an “in addition” to our meal. We also will eat a lot of salads with dinner or the kids will grab a bunch of veggies & dip. Due to gluten issues, we cannot eat alot of starches, but if your able to do that, you can stretch the meal with rice, potatoes, pasta, etc. I use to make alot of casseroles, so 1-2 chicken breast will feed 4 hungry people (3 boys), plus leftovers for the hubs to take to work. How about homity pie? There are various recipes around but this is quite close the one that I put together. Quiche can have various guises-cheese and onion is particularly economical but it possible to vary the filling according to what you have around. My husband loves spicy food. I find if I make the dish flavorful, he doesn’t miss the meat much–and he’s perfectly fine with me saving money and cooking meatless for at least 2-3 meals per week. He’ll eat anything Mexican, so most of our Mexican meals I make meatless–bean burritos, enchiladas, egg burritos. I found this recipe for a quinoa and black bean dish from allrecipes.com that we really like: http://allrecipes.com/recipe/quinoa-and-black-beans/detail.aspx?event8=1&prop24=SR_Title&e8=Quick%20Search&event10=1&e7=Home%20Page. Sometimes we eat it in tortillas with cheese, sour cream, salsa, etc., and sometimes I serve it alone. It’s a nice one-pot meal. Curries work well for meatless meals, too. While I usually make chicken curry with veggies added in, I made my usual recipe without chicken a few weeks ago and just bulked it up with chick peas and cauliflower. I serve it over rice with plain yogurt and Arabic bread. My husband and I both enjoy breakfast for dinner. I usually do this about once every two weeks. Typically we alternate between upbasted eggs, scrambled eggs/egg burritos, omelets, pancakes, and waffles. Doing a big salad for dinner can be a great option, too. We like to grill chicken and chop it up to include in the salad–along with a bunch of other toppings–but you don’t have to. Sometimes I’ve just done a salad and muffins for dinner. Recently we’ve been doing “fancy” wraps and sandwiches, too. We love to spread avocado on homemade bread, top it with feta cheese and/or some other sort of cheese, tomato, roasted or fresh peppers, and lettuce–we don’t even miss the meat. Dressing up grilled cheese sandwiches (adding sundried tomatoes, fresh basil, different types of cheeses, etc.) or doing a Greek-style quesadilla (red onion, spinach, mozzarella, feta, fresh oregano, peppers) is yummy, too. One other meatless meal my husband enjoys is potato soup. Sometimes we do baked potatoes with toppings as the main dish, too. That quinoa recipe from allrecipes is my absolute favorite quinoa recipe – so yummy, and quinoa is high in protein! I have found that three whole chicken legs ( which regularly go on sale for 99cents a pound is more then enough chicken to make a good soup. I place the legs, a whole onion ~ no need to dice~ celery and a few carrots and salt and pepper, in the roaster and roast in the oven for two hours at 350. YOu will have a wonderful stock ( without all the sodium of canned broth) and LOTS of it. I dice up the cooked carrots, pick off the meat and make my own dough. One egg, one cup of flour, 1/2 teaspoon of salt and roll till it forms a ball. If needed add a splash of milk. roll out with your rolling pin ( again kids love to help here) and cut into strips for chicken noodle soup or squares for a pot pie effect. I have used rice and store bought noodles when time was a factor. I can make a large roaster of soup for under $5…having leftovers in the frig for those ” I am hungry mom” moments. main lesson learned was I didnt NEED all that MEAT, nor did it need to be a whole chicken to make a very good healthy broth. Hey there! Here’s a recipe I posted from one of my favorite cookbooks (“Fresh from the Vegetarian Slow Cooker”): http://crumbyvegan.com/?p=934. It’s a vegetarian potpie recipe, which costs only $3.29 to make! Hooray!! Also, check out other posts on my website: http://www.crumbyvegan.com. I try to include costs for each post, which is designed to show that it’s not expensive to eat organic or vegetarian! I am a big soup maker….with lots of schedules to accommodate and to stretch the food budget. I already posted on homemade chicken soup but another family favorite is creamy cauliflower soup. In a pot sautee onion, minced garlic, and salt and pepper. add cut up head of cauliflower. slicing up the stems very thin~ waste not! Add one 32 0z can of chicken stock and bring to a boil and until the cauliflower is soft. Add 1/2 cup milk. Add in batches to blender and blend until smooth. repeat with all of soup. reheat. A loaf of warm bread and a bowl of hearty soup will fill you up everytime. I make tacos tostadas and burritos. For the meat in each of these meals. I will use half ground beef and half TVP rehydrated. Once cooked up with some seasoning it looks and taste much like ground beef but with half the meat. My husband who is a real meat eater really likes it. I buy my TVP in the bulk section of Winco Food but you can also find it at Azure Standard and at health food stores. To stretch the meat further you can add meat, rice and beans to burritos to be able to make more burritos without having to make more meat. TVP also works good in pasta sauce too, use half the meat and use TVP added. I doubt anyone will know. You can also add TVP to stretch meatball mixture and meatloaf mixture. When you can find poultry on sale at a good price you can cook it in the crockpot and shred it for Pulled BBQ chicken sandwiches. If you get the bone-in chicken or whole chicken you can save over boneless. It does take more time but you can make a big crockpot full of meat, cook until falling off the bone, remove the bones, shred the meat and add BBQ sauce and freeze the leftovers. The above also works great to make pulled pork meat. I will usually wait until I can get a pork shoulder roast cheap and prepare it the same way as the chicken. I grew up with six brothers – make sure to round out every meal with lots of hearty bread. It’s a good filler, it’s cheap, and it can be really healthy if you make it yourself with WW flour. Always have plenty on hand for toast with breakfast, fresh rolls for snacks, and a big loaf of artisan bread with dinner. Lentil tacos, black bean burgers, veggie pizza, beans and rice, hummus and falafel. My husband loves all of these!! Substitute veggies for meat in meals…ex: cheeseburger pie: use a cup of frozen veggies instead of meat. Explore the wonders of ethnic cooking….there are some awesome Thai, Indian, Greek, etc. recipes that don’t use meat that are diving! Heat oil in a large saute pan over med-med/high heat. When oil is shimmering, add corn tortillas and cook, stirring occasionally, until the tortillas have absorbed the oil and are turning a nice golden color. When they are cooked and some are slightly crispy on the edges, add salsa and cheese and cook until cheese is melted and salsa is completely incorporated. Be careful, as the salsa will sputter a bit when it hits the pan. At this point you can add more salsa or cheese if you desire. Serve with 1 or 2 over-medium eggs, allowing the yummy yolk to run down into the tortilla mixture and make a creamy “sauce”. Alternately, top with scrambled eggs or whatever type of eggs you like. These are DELICIOUS with a bit of sour cream, some chopped avocado, chopped green onions and a generous sprinkling of freshly ground pepper. But when the fridge and cupboards are bare, the main ingredients are very tasty by themselves. You can also sub flour tortillas instead of corn, you will just get a bit of a crunchier (and less dense) texture. Great suggestion! We often make it with a little left over enchilada sauce instead of the the salsa and if I have a little chicken left over I throw that in with the tortillas to give a little extra protein. House of 4, I’m the only female 🙂 My husband loves meat, and these satisfy him. Good Luck! Brown meat add peppers and onions and chili powder continue to cook until onions and peppers are semi tender. Add all canned goods(don’t drain any of them) Simmer about 20-30 minutes. Serve with cornbread. Combine all and simmer about 25 minutes. Serve with shredded cheddar and fried tortilla strips(or cornbread). And of course there is BREAKFAST!! We eat breakfast once a week. Eggs are so easy to mold to whatever flavors you want. Experiment!! Vegetarian quesadillas are a big hit at our house, as well as anything based on cheese/eggs. Breakfast for dinner is popular, too! I make a bean pie that my family loves, sometimes I’ll put sausage in it. I know it sounds weird, but it’s yummy. I received this recipe almost 18 years ago from W.I.C., they handed out a cooking with beans book at one of their meetings. Turn oven to 350º F, Mix everything, saving 1/2 the cheese, put into pie crusts and bake for 20 -25 minutes, top with remaining cheese bake for 5 more minutes. Let it sit for 15 minutes before you cut it. Super easy go to lunch. I cook both, and sometimes wrap and freeze one. We really like this lentil taco recipe. We use rice when we don’t have quinoa. I also started using the freezer friendly burritos from MSM and adding rice and cabbage (or peppers) to stretch them and add some veggies. A trick I discovered in a magazine, also, is that you can replace about half the ground beef of a recipe with cooked bulgar. It looks about the same and doesn’t change the texture too much. I’ve done it in tacos and baked with potatoes and carrots. I recently started using lentils to cut the fat of hamburger. Works well in tacos or any type of scrambled beef recipe. I don’t care so much for the flavor or the bean sludge so rinse and rinse again and I promise you will never know the difference. Try this recipe below. It is SOOO filling and delicious. They will forget about the meat because they’ll be fast asleep taking a food nap after. My husband is from Mexico and they could teach us all a thing about eating less meat because most people can’t afford to buy a lot of it. We cook pinto beans (in the crock pot, with salt) often and re-fry (with butter or oil) them and eat them in burritos with cheese. Also, and this may sound weird, but it is very good. Scramble a few eggs, and fry flat in a skillet, with oil, and when it is cooked, turn and then break into smaller pieces (inch or so) and add cooked beans (whole beans, with liquid) to the skillet. Basically just let the beans heat up, you want it a little “soupy” but not too much liquid. Eat with tortillas. Along the same lines, fry cut up pieces of hot dogs and scramble with eggs. And another great tip is to make tacos with either ground beef or small pieces of cut up meat, and add little squares of potato and fry all together. This stretches the meat you do have. Black bean soup is another great meatless meal we enjoy often. I know some of these ideas may seem really foreign, they were to me when I first met my husband, but now I enjoy them and my kids do too! I alway LOVE the little potato cubes mixed in with the meat when we go to an authentic Mexican restaraunt. I don’t know why I never thought to do it at home! My mom always shreds a potato into the hamburger when she makes her tacos. Tastes really really great and stretches it too! When the weather warms up, my husband (a confirmed meat-aholic) really enjoys a hearty green salad for dinner topped with meat. I usually use grilled steak, or chicken (one small steak is enough for two salads). I also make a chef salad with eggs, diced ham and cheese. It’s filling, delicious, does not heat up my kitchen, and still has the meaty goodness he craves. Another good dinner is homemade quiche – eggs, some cooked and crumbled bacon or leftover chicken, or sausage, veggies, leftover bits of cheese, etc. I use the recipe for Quiche Lorraine from my old Betty Crocker cookbook, but you can find good recipes all over the internet. I just use whatever is on hand for the filling. I usually serve fruit on the side. It’s hearty and inexpensive. I make a Mexican lasagna with layers of tortilla shells, hamburger, cheese, tomato sauce, etc. For a summer party, I made two – one using black beans and the other the meat. Guess what? The black bean one was the favorite!! I also use black beans for stuffed green peppers. In a skillet, cook your beef and green pepper until soft. Drain fat. If using beans, saute your green pepper and then add beans and heat. Add spaghetti sauce, 1 cup of the picante sauce and chili powder. Heat to boiling and then reduce heat to low and cook 10 minutes. In 3 quart casserole dish, spread remaining picante sauce. arrange four tortillas in dish. Top with half the sauce mixture, half the cheese, and half the olives. ( I sometimes do olives on one half and not on the other in case children don’t like them). Repeat layers. Bake at 350 degrees F for 20 minutes or until hot. Let stand 5 minutes. Serves 8. I usually make two of these and freeze one. Sorry for the double entry! and the black bean amount may not be right. I cook a bag of beans and divide it into four servings. In skillet, cook ground beef and green pepper until beef is browned. If you use black beans, saute green pepper until soft. Add the beans to heat. Add your spaghetti sauce, 1 cup of the picante sauce, and chili powder to beans and green pepper. Heat to a boil and reduce heat to low and simmer for 10 minutes. In a 3 quart casserole, spread remaining picante sauce on bottom. Top with half of your tortilla shells, add half the sauce, cheese, and olives. (I sometimes only use half the olives on one side of the casserole in case someone doesn’t like them). Repeat layers. Bake at 350 degrees F for 20 minutes or until hot. Let stand 5 minutes. Serves 8. I usually make two at one time and freeze one for later. I make stuffed green peppers with rice and meat. how do you do it with beans instead? Just substitute a can of black beans in place of your meat. Or use 16 oz.. of black beans you have cooked from dried beans. I may have the amount of black beans wrong… I cook a bag of beans (1 lb) and divide it into four servings when they are done. We do baked potatoes with any kind of topping imaginable. Our favorites are sauteed veggies, bacon bits, sour cream, or broccoli with cheese sauce. This is one of our cheap dinners and VERY filling! We like baked potatoes topped with leftover chili. This meal is vegetarian, easy, and is made in the crock pot! Plus, the leftovers taste great. I have the recipe in an old Prevention magazine cookbook, but I found this link and it is essentially the same thing. Here’s a recipe that’s fairly cheap to make (I leave out the scallions, cilantro, sour cream just because I like fewer ingredients). It’s a standard at our house because it’s tasty. It’s spicy, but you can adjust that. PLUS, my husband didn’t notice that it was meatless until the second time he had it. I really thought that was compliment. i am totally serious when i say see what you can cut before you give up meat – call me what you like, you are likely to have to keep on feeding people who are hungry for meat but are getting carbs instead – the lowly egg seems to go a much further way with my die-hard meat eaters than any flour-based dinner if there is not anything left to cut out budget-wise! I agree! I’m not looking to fill my family with cheap carbs, I want them to eat nourishing meals that stick by them. We may eat more meat at meals than most families, but I find that we’re not snacking as much between meals now that we’ve cut back on grains. These are all really great ideas! I’m going to add more meatless meals to our menus! We’re found quiche to be a good protein, meat-free meal, or having soup and sandwiches. My favorite is my super cheap and tasty Tomato Basil Bisque recipe (http://marriageonabudget.com/mm-yummy-cheap-tomato-basil-bisque-recipe/) and grilled cheese sandwiches on French bread. The taco meat can be used in tacos, burritos, salads, nachos or enchiladas. Using half beans and half meat really stretches it. In the winter I like to make bean soup or lentil soup. Quiche is another meatless meal. And bean burritos is one of my go-to meals, just tortillas, a can of refried beans and cheese! I LOVE these chickpea wraps. My four year old has deemed them as the best sandwich ever, and my father-in-law (who loves and expects meat) deemed the meal be to perfect. –taco soup (pinto beans, black beans, corn, tomatoes, chiles, cumin, and dry ranch) topped with cheese, sour cream, and Fritos and my husband didn’t notice it was meatless the first few times I made it. –breakfast food (pancakes, waffles, French toast, eggs, bagels and cream cheese, biscuit sandwiches, etc. -Grilled veggie sandwiches. I’ll roast chicken for Sunday dinner with a bunch of veggies. Keep the left-overs for pizza or sandwiches. Put them in a baggie with Italian dressing to marinate for a day or two. Put on good crusty bread with some pesto and cheese and grill. -Sweet potato hash and eggs with sauteed veggies. Apologies. That’s a long list. Thanks for all the great ideas! Is there a recipe for barley risotto? I have a lot of pearl barley (and I’ve been trying to find creative ways to use it up without resorting to soup–we’ve already made a LOT of soup with it). This is one of the crockpot versions. Hubs and I like to cook the onions/garlic first but it works either way. It’s great with mushrooms. Hope you like it! For any recepie that calls for browned ground beef stretch it out by adding one container of firm tofu, crumbled into one pound ground beef. My family loves this for taco, chile, quisadillas. For any burger or meatball style recepie add 1/2 beef mixed with 1/2 cooked veges that have been pureed in the food processor. We love zucchini, mushroom, onion and red bell combined. Actually makes the meat so much more tender, yummier and less calories and cost. I have a ton of meatless recipes on my site. We’re not vegetarian or vegan but we believe in eating healthy. I’d highly recommend checking out the Roasted Butternut Baked Penne and the Southwest Quinoa Salad. I think those will be hits! I think everyone should try the Southwest Quinoa Salad… it is amazing! Thanks for the love Autumn! Looking back through some of the recipes I’d also DEFINITELY recommend the stuffed portabella mushrooms and the Tomato Basil Cream Pasta. Those have to be my favorites. For two meals/week, I cook black eyes peas. Normally I’ll add to that mashed potatoes, turnip greens, and cornbread. With summer at hand, we will vary the meal with many more vegetable dishes. Anyway, we love filling up on the vegetables. For those who mentioned using lentils to stretch meat in a meal, how do you do this? Do you cook a large batch of lentils and freeze them to use when needed or do you cook the lentils as you need them? I have used them both ways. Lentils only take 15 minutes to cook it’s one of the things I like about them. They have a strong flavor so rinse them really well before and after you cook them. Wow, so many great ideas here! I agree with all those who suggest eggs as a great alternative. Cheap and you can stretch them. One of my faves is breakfast-style tacos with corn tortillas (dirt cheap in my area). To make 2 generous tacos for each of us, I usually use 2 eggs and then bulk up with whatever veggies I have around (peppers, cooked broccoli, shredded carrots, cooked potatoes, onions, etc). I usually add a small handful of canned beans too. I vary the balance–2 eggs gets you mostly veg/beans with just a light egg binding but adding an egg makes it more eggs with some veg mixed in. I might add some meat like 1 strip of crumbled bacon, 1 crumbled breakfast sausage link, some ham, etc, or I might not. Divide between the 4 tacos, top with salsa or hot sauce and occasionally a tiny sprinkling of a flavorful cheese like a sharp cheddar, a pepper jack, some feta. I pair it with some fruit and even my big eater husband finds it to be a really satisfying meal for breakfast or dinner. Seven layer bean dip is always good. My family also makes what we call mount Olympus. It is frito chips topped with canned chili, cheese, lettuce, sour cream, olives, tomatoes, and salsa. You can really add whatever toppings you and your family prefer. Simple and when chili is on sale and the store relatively cheap. When I’m not in the mood to serve meat, I make ‘fassulia’ which is a middle eastern bean dish. It’s made with great northern beans, tomato paste, water,, salt pepper and allspice. I let it simmer on a low flame for an hour or so. It’s really tasty and is best served over rice. I sometimes add meat to make it a more rounded meal, but I still great meatless! My hubby is a meat-lover, but luckily he likes pasta too! Pasta happens to be cheap, so we fill up on pasta (with lots of veggies). You can always through a little ground beef in there too, which makes it feel like there’s meat, but it doesn’t have to be a lot. Mushrooms are another great way to add bulk. And my mom-in-law always tells moms to have bacon bits on hand. A little bacon in a dish makes it feel more meaty, but it doesn’t have to be a lot or cost a lot. We really like a roasted red pepper linguine. You can easily roast your own peppers in your broiler. Aldi has been having sales of the stop-light variety in my area for $1.49. Roast the peppers on a cookie sheet (8 minutes to a side) on broil. When all sides are charred, I put them in a brown paper bag and fold closed. Let cool and they’ll be easy to peel, seed and slice. Use one red pepper in your sauce with a little red pepper flakes and some chicken broth. Puree. Use 8 oz. of cream cheese (the recipe I use calls for chive cream cheese but I usually just use regular with some Mrs Dash garlic seasoning). Add puree and let heat. Add the other two peppers you roasted. Serve over whole grain linguine with some parmesan cheese on top. It’s quite good. Sadly, I don’t remember the website I used to find it so I can’t give exact measurements (I’m at work). My cousin recently turned me on to the great recipes at http://www.wholefoodmommies.com. I think all or most of their recipes are meatless and healthy. My husband is a big meat eater and usually scrunches his nose up at “meatless.” He does, however, LOVE these black bean quesadillas from budget bytes. http://budgetbytes.blogspot.com/2012/02/hearty-black-bean-quesadillas-661.html They are super freezer friendly too! Don’t give up on the meat entirely, it doesn’t have to be as spendy as it sounds. I have a limit of $2/lb on my meat outside special occasions. I usually get cheese at best at $3/lb. And my cheapest milk not marked down is $3.59. Now I hear about you girls in Cali getting it for $2.59 (whoo hoo) so all this will vary by region. We usually buy ham (.99/lb easter, 1.29/lb thx/xmas), turkey (free-.99/lb thx/xmas), boneless chicken ($2/lb sams), sausage, and huge bags of real bacon bits–my favorite ($9 = 5lbs uncooked). I add these bacon bits to omelets, breakfast quesadillas, baked potato bar, salads, pizza, alfredo sauce, etc. A little goes a long way in the flavor department, and the men folk consider it a meal with meat. The hams and turkey we saved money and buy several at the holidays. I buy the shank in ham, have the butcher chop off the bone in and cut it in half. Then I have two chunks for ham and beans, plus the bone in the ham we are going to eat as steaks for a third. That’s four meals, plus we always have a fair amount of extra meat that gets cubed and frozen for use in pizzas, omelets, quiche, breakfast burritos, chicken cordon bleu casserole, etc. I do the same with the turkeys, except I get way more cubed meat and broth/stock rather than bones for beans. Actually really economical. Where I’m at, dairy and fresh veggies are way more. You just have to plan ahead and buy it all when it is cheap. We also half recipes for what the meat calls for. example: I use one lb of sausage for the whole red sauce #10 can (makes 6 jars). We also glean. We know a taxidermist and butcher who always seems to find himself acquiring more meat than his family can eat. Rather than waste it, he cleans and processes it and gives it away to friends. Or trades it for services he needs. Think outside the box on ways to get meat cheap or free. My family LOVES 13 bean soup. I buy the 13 bean soup mix in the bulk section of my local Winco. It is ridiculously inexpensive, I think $1.28 per pound. Put the bean mix and an onion in the crockpot for 4 hours. Top with crushed tortilla chips and enjoy! I’m in the same boat as Alicia, and I really haven’t had much success with meatless meals but there is one that we love: cottage cheese patties! Sounds weird, I know, but I recently posted the recipe here: http://springsbargains.com/2012/05/quick-cheap-recipe-pan-fried-cottage-cheese-patties/ and quite a few people tried it and liked it! 🙂 Very filling and very cheap. One of my favorite inspirations for inexpensive meals is http://www.5dollardinners.com. Some are meatless, some are not, but they all appear to be fairly healthy and any of her recipes I have made my family has enjoyed.